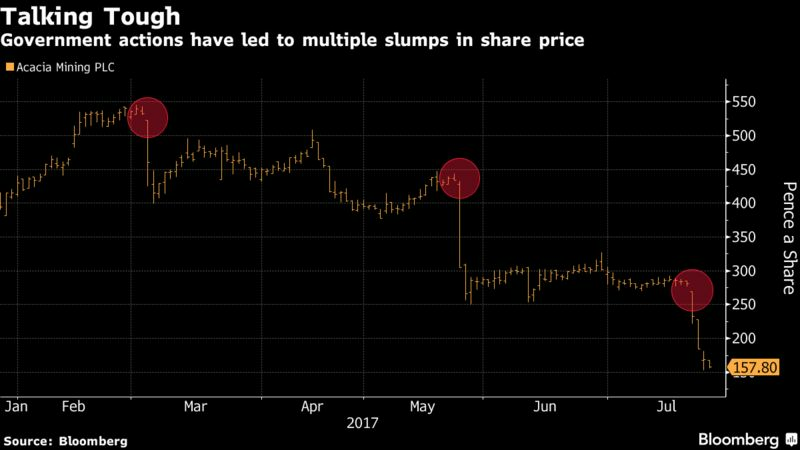 It was supposed to mark a fresh start for the African business of the world’s biggest gold producer. In November 2014, African Barrick Gold Plc would get a new name and new management to distance itself from a troublesome past and disputes with local politicians. Less than three years later, things are worse than ever. Acacia Mining Plc, renamed after a local tree with pom-pom blossoms and finger-length thorns, has just been handed a spectacular $190 billion tax bill and fine from the Tanzanian government. The figure is four times the size of the country’s gross domestic product or 70 times the record penalty that the European Union dished out to Google last month. That followed the country’s ban on exporting gold concentrate, its allegations of illegal mining and tax evasion — denied by Acacia — and police interrogations of at least two employees. The stock has tanked 45 percent in five days. The contrast with parent Barrick Gold Corp.’s plan to reboot operations in 2014 couldn’t be starker. Acknowledging weak local relationships in the past, Acacia told investors it aimed to be the “partner of choice for governments and communities.” The situation shows how global resource companies are hostage to such domestic connections. The company’s not the first to receive a huge bill in Africa. Last year, Chad hit Exxon Mobil Corp. with a $74 billion fine over taxes. The oil producer reached a settlement last month that avoided the penalty. MTN Group Ltd. was fined $5.2 billion by Nigeria over a missed deadline but ended up paying $1 billion. Barrick had been struggling in Tanzania for more than a decade before deciding to spin off the business into African Barrick Gold in 2010. But that didn’t solve problems at the company. It missed an annual production target of 1 million ounces of gold by 2014, with output instead dropping for three straight years. The company’s Buzwagi mine was infiltrated by a criminal gang that stole fuel, forcing it to suspend 60 workers and cut shipments. There was an even darker side to the troubles. A 2010 investigation by Bloomberg News found that at least seven people died in clashes with security forces at the North Mara mine in the previous two years, and 15 were seriously injured in the period. A report by Rights and Accountability in Development, a U.K. charity, this month said at least 22 people had been killed and 69 injured at or near the mine since 2014. The North Mara mine has struggled with violent confrontations by trespassers looking to steal gold-bearing material, Acacia said in a statement. Yet, there has been a “dramatic improvement” at the site in the past three years, with the company working to boost relations with the local community and improving security to cut incidents, it said. Intruder fatalities fell to six last year from 17 in 2014, according to its annual report. “It is difficult to pinpoint the exact origin of the dispute between Acacia and the government and, arguably, it goes back to Barrick’s first major investment in the country in the late 1990s,” said Charles Gibson, an analyst at Edison Investment Research Ltd. Gold prices were near lows when terms were negotiated and as they rose the government hasn’t seen the increased tax revenue that it wanted, he said. Part of that’s due to the Acacia mines performing worse than expected, with Bulyanhulu and Buzwagi routinely failing to make money. That hasn’t stopped the government escalating its campaign against the company this year. An audit ordered by President John Magufuli in March said that Acacia had been conducting business “contrary to the law,” while a presidential panel accused the company of failing to fully declare all the minerals in its concentrate. Acacia says it declared all revenues. Acacia said last week that it “fully refutes” exporting undeclared gold concentrates. The company is cooperating with investigations and has supplied documents and employees for interviews, it said. Talks between the government and Barrick were imminent and the preferred outcome was for a negotiated settlement, the miner said. The president has incited “anti-colonial resentment to paint a picture of rapacious Western investors cynically depriving Tanzania of its natural wealth,” said Gibson at Edison. In the meantime, the country’s ban on concentrate exports is costing Acacia $1 million a day in lost revenues. On Friday, the company said the dispute had depleted its cash balance almost by half to $176 million from a year earlier and it would have to shutter its flagship Bulyanhulu mine at the end of the quarter if the situation isn’t resolved. That’s damaging for the business but also for Tanzania’s reputation.